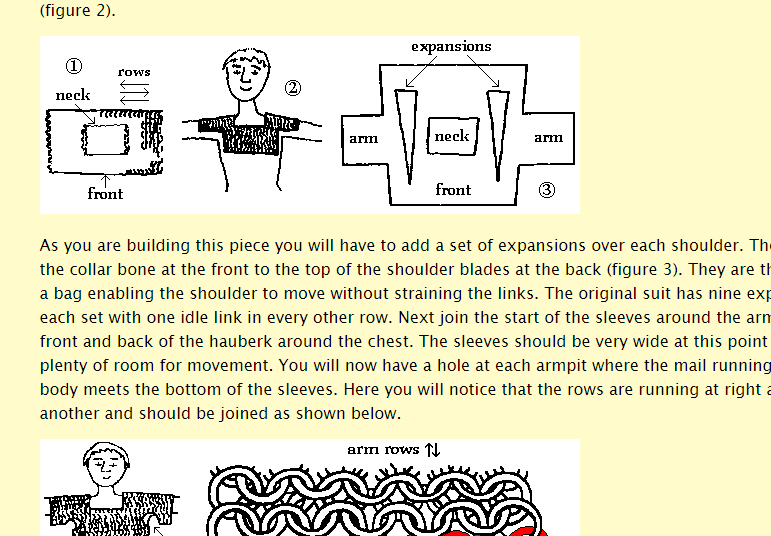 Here is a collection of useful articles, papers and resources for re-enactors looking to use mail armour. Whether you’re building from scratch or modifying commercially available mail armour, most re-enactors can benefit from some extra information on how their mail is supposed to work and how it should be shaped. This guide has been passed around the internet in various forms for maybe 20 years. 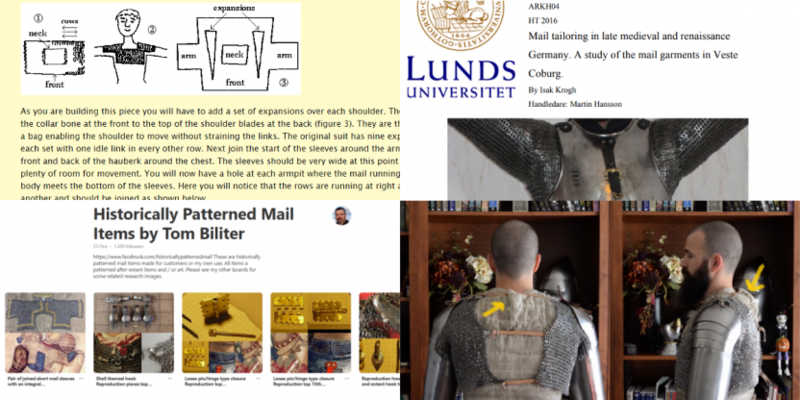 Although written for making butted mail, the clear descriptions of basic tailoring techniques are also valid for riveted mail. Blackwell’s patterns are based on extant armour and build on the work of Martin Burgess. 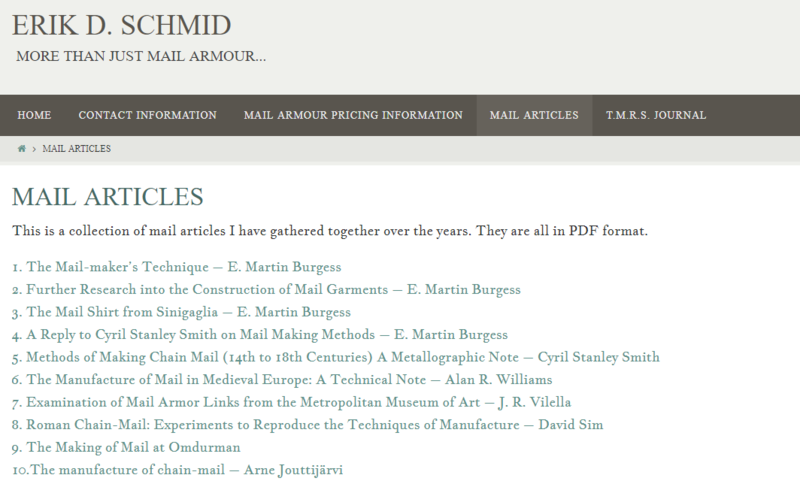 Mail armour reproduction pioneer Erik D. Schmid maintains a collection of important papers and journal articles, available on his website. Notably, the key papers by Martin Burgess are available free of charge. 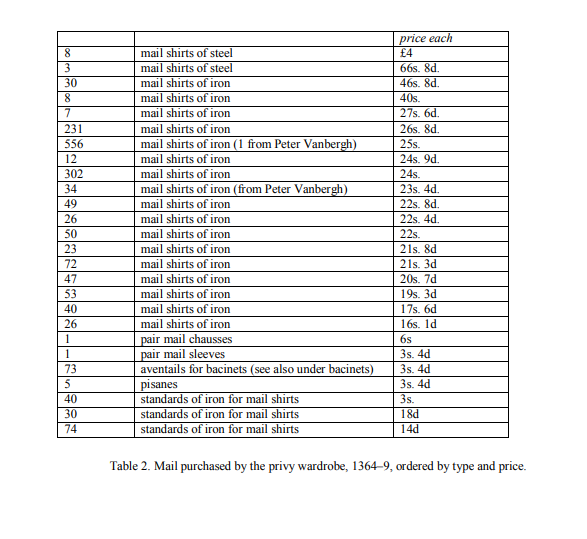 In the collection of Veste Coburg there are 28 garments of mail. This thesis examines the tailoring of 21 of these garments. The goal is to try to answer questions of use and function in collaboration with artistic evidence from the late middle ages. The method used for documenting the tailoring techniques is based on marking out specific rings important to changes in the weave, like expansions/contractions along and crosswise the weave direction, or changes in the direction of the weave. Doing this reveals patterns that can show how the garment is put together and what concerns were being met in designing the armour, like protection, weight, fit, and mobility issues. Because of the variety in types of garments and quality, many aspects of wearing mail can be explored. The timespan of the objects range from the 14th to the 16th century and several aspects of the tailoring can be linked to armour shown in contemporary artwork. For more by Isak Krogh, check out his Facebook Page. 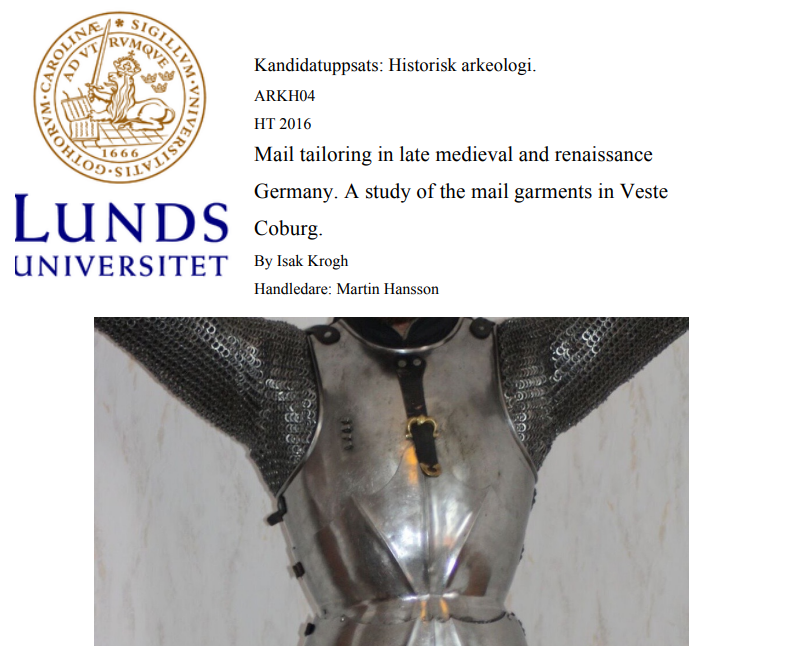 An important study of the records of the Tower of London armouries in the fourteenth century, giving insights into the types and quantities of mail armour used. Robert MacPherson‘s study and reproduction of C16th sleeves in the collection of Wade Allen. 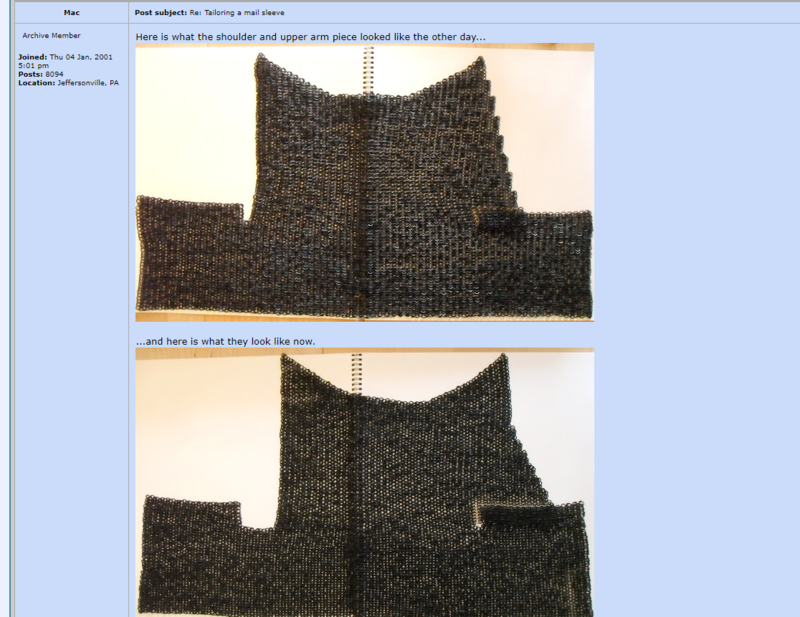 Be sure to read through the thread, as the first pictures do not reflect the final pattern. 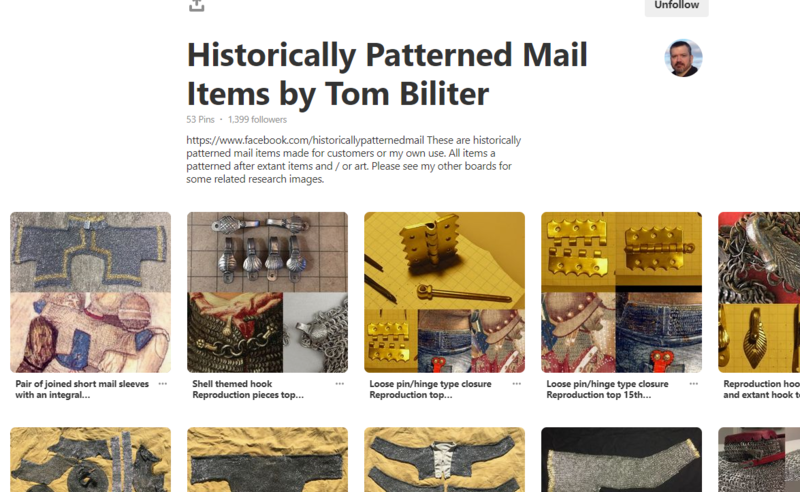 See also Tom Biliter‘s final pattern, made in collaboration. Erik D. Schmid demonstrating his link manufacturing technique and how he achieves the ‘watershed’ shape. 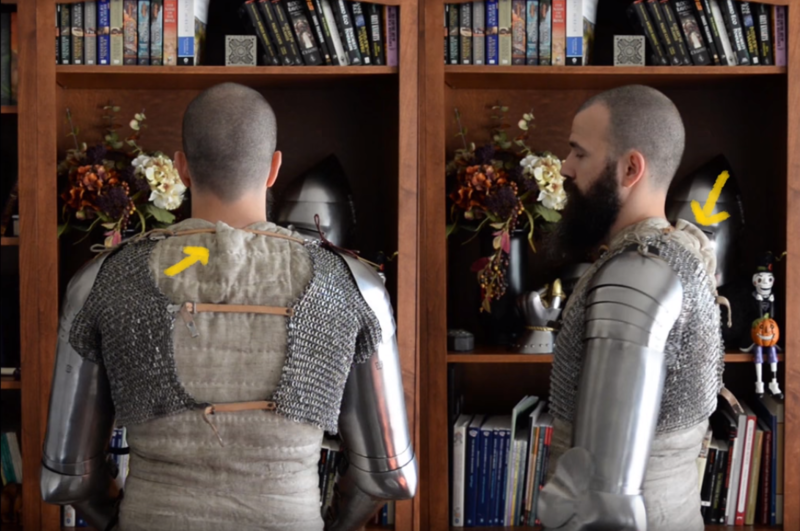 Ian LaSpina’s Knyght Errant channel on Youtube is an invaluable resource for clear communication of the ‘state of the art’ in fourteenth century armour research and reproduction. 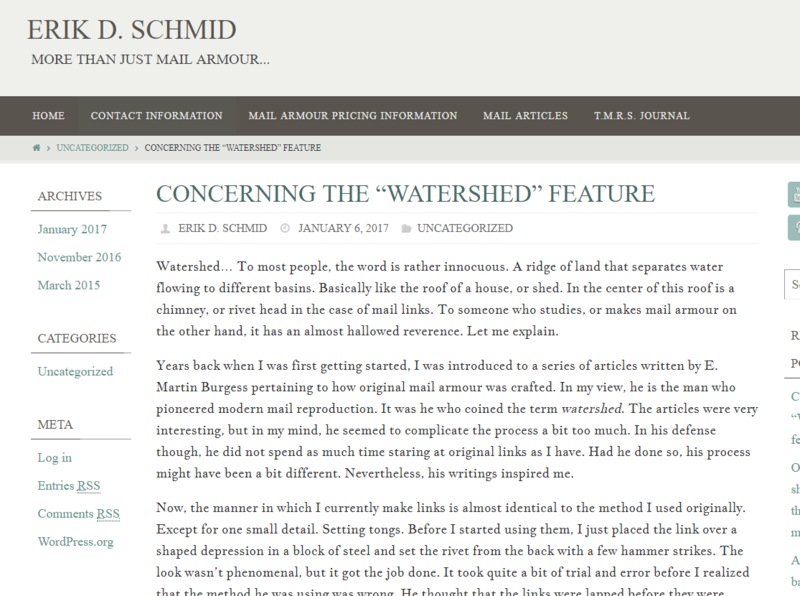 Among his videos are several on mail armour. I’ll link a few below, but it’s best to check out his channel to see them all.